You Are Here: Home > What is SKYACTIV® TECHNOLOGY? We know that many drivers have heard the words “SKYACTIV® TECHNOLOGY” before, whether that’s when they research Mazda vehicles online or visit Biggers Mazda in Elgin, but the cutting edge technology under the hood of vehicles like the Mazda3 is likely a mystery to most of you. As part of their Sustainable Zoom-Zoom philosophy, Mazda has innovated engines that are not only powerful and fun to drive but also work at keeping the earth green by improving fuel economies across the board. SKYACTIV® TECHNOLOGY is about more than just engines—the philosophy extends to transmissions and entire vehicle platforms—and we want to make sure you know just how Mazda’s unique technology can benefit you. Automobile engines have been developed for over a century, and yet major leaps in innovation have been few and far between. Many automakers have been comfortable with this, but Mazda saw that 70-80 percent of the available energy in a drop of fuel is lost in the vehicle’s powertrain and cannot be transferred to the wheels—and they insisted on doing something about it. Currently, Mazda is working on Homogenous Charge Compression Ignition (HCCI), which takes advantage of the fuel-saving technologies in diesel engines while still using traditional gasoline, and it’s just the start of the road to an ideal combustion engine powering every new Mazda. SKYACTIV®-G: Achieving the world’s highest gasoline engine compression ratio of 14.0:1 with the help of a 4-2-1 exhaust system, the SKYACTIV®-G engine features 15 percent increases in torque and fuel economy and improved low-engine-speed torque for better everyday driving. 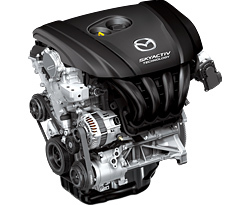 SKYACTIV®-D: The “D” stands for “diesel,” and by incorporating a low compression ratio—the world’s lowest for a diesel engine—you can get the power and efficiency you need while still abiding by the strict emissions guidelines for diesel engines. With a 20 percent improved fuel economy over competing diesel models and a new two-stage turbocharger, SKYACTIV®-D engines are leading the pack. The importance of the transmission is two-fold: fuel economy and engine response. By improving gear ratios and settling your engine into the most efficient mode, a well-designed transmission can improve your fuel economy substantially. The way a vehicle feels from behind the wheel is just as much the responsibility of your transmission as it is your engine, and since different drivers often look for different things in their vehicles, most automakers have resigned themselves to a variety of different automatic transmissions. Mazda created the SKYACTIV®-DRIVE transmission to take care of the needs of every fan of automatic transmissions, but they also created a brand-new manual transmission for those of you who need to keep your foot on the clutch. 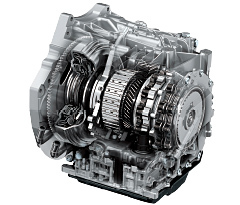 Automatic: The SKYACTIV®-DRIVE transmission gives you all of the benefits of automatic transmissions, dual-clutch transmissions, and continuously variable transmissions in one piece of technology, resulting in a widened lock-up range for faster torque response and as much as a 7 percent increase in fuel economy. Manual: Of course, some drivers will always prefer the manual transmission, and Mazda has you covered with SKYACTIV®-MT. The lever ratio is increased to give you a crisp, light shift feel like a sports car, and Mazda has been able to reduce the weight and size to show just how significant of an improvement this is over traditional manual transmissions. SKYACTIV® platforms are right in line with Mazda’s focus on driving pleasure, putting a priority on a lightweight structure. It might seem like a simple thing to be concerned about, but by reducing the weight of vehicles and placing them on a SKYACTIV® platform, Mazda is able to boost fuel economy, improve performance, and yield a more enjoyable drive overall. 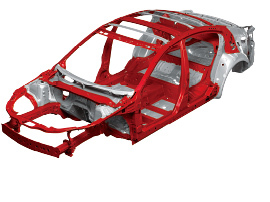 As part of a commitment to reducing the weight of models across the lineup, SKYACTIV® platforms are designed to help drop up to 200 pounds through weight reduction, centered primarily on the chassis and body and resulting in a lighter, more rigid body for improved handling and increased crash safety. Body: The new rigid body design not only helps boost Mazda vehicles’ fun-to-drive feeling but also raises crash safety performance to exceed the top expectations in all auto markets. The basic principles of body construction were examined and revised, using the best lightweight materials and high-tensile steel. Chassis: Mazda looked at how drivers of the famous Mazda MX-5 Miata felt a “oneness” with their vehicle and explored the chassis, taking design elements from the Miata and applying them across the board. The result? Revised suspension and steering for improved comfort and driving pleasure, increased comfort behind the wheel, and newly developed suspension and electric power steering systems resulting in a 14% reduction in weight over previous models. Try Out SKYACTIV® TECHNOLOGY at Biggers Mazda! When you visit Biggers Mazda, we can and will talk with you all day about the advantages of SKYACTIV® TECHNOLOGY, but words can only go so far. You need to see the Mazda lineup in action, and the only real way you can do that is with a test drive. Experience SKYACTIV® TECHNOLOGY for yourself today—you won’t regret it.